It’s not very often that the head of state of a superpower nation is sent such a dramatic and violent message. 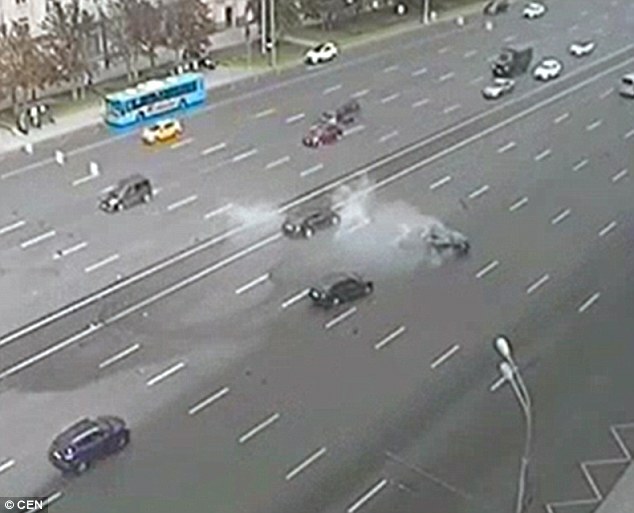 That appears to have just happened with the killing of Russian President Vladimir Putin’s favorite chauffeur while he was driving the president’s official automobile. Such an audacious threat to the life of President Putin can only be coordinated by an inside group of foreign secret service agents who have proxies operating within Moscow. Moscow is so large that the agents themselves may have planned and carried out the attack from right inside of the city. In any event it is quite clear that those who reside at the peak of the pinnacle of the Anglo-American Axis (AAA) power pyramid will stop at nothing to control Russia and its destiny. They know that as long as Putin remains at the helm of the Russian government, there is very little they can do to stealthily usurp the sovereignty of that nation. Nevertheless, they have continued to attempt to chip away at Russian territorial integrity by employing Islamic extremism and ISIS terrorism in countries that are located on the outskirts of the Russian Federation. The AAA leadership has shown time and again that they are populated by a number of criminally insane psychopaths who will stop at nothing until they have taken back Russia (they owned it once under the rubric of Soviet communism as the USSR). Now the same misguided cabal wants to take ownership again by way of a capitalistic political economy. Through a combination of predatory capitalism, economic sanctions, monetary sabotage, financial terrorism, weather warfare, as well as strategically located unprovoked wars of aggression and jihadi terrorism, they are focused on bringing down the present government. Is there anything the criminal cabal will not do? Because of the grave state of the Global Economic & Financial System (GE&FS), those who control the underlying control matrix are in an extremely desperate condition. Although they have somehow been successful at artificially propping up the whole House of Cards for decades, there is now a mathematical certainty of a global collapse. There is simply no stopping it. Given the enormity and profundity of the coming breakdown (economic, financial and social), this misguided crowd is looking to steal everything in sight before anarchy takes over. They know that there is no bigger prize than the Russian Motherland. Even as it shrunk substantially from its previous boundaries delineated by the borders of the old Soviet Union, Russia is still a humongous landmass. From the Pacific Ocean to the Gulf of Finland, from the Arctic Ocean to the Caspian Sea, Russia is by far the largest country on Earth at over 17 million square km. That’s almost twice as large as Canada, China and the USA. Much of the Russian Motherland is uninhabited and rich in natural resources. Oil and gas, gold and silver, uranium and coal, diamonds and various precious gems, timber and granite, marine life and other wildlife, are all available in great abundance. Each of these is greatly coveted by the AAA cabal since they have sold most of their natural resource assets off since the very beginning of the Industrial Revolution. Hence, they are making extremely desperate moves in every direction at the present moment, from deepening the Second Great Depression to triggering World War III. Taking out their arch-enemy Vladimir Putin, then, pales in comparison to the vast amount of death and destruction that they have already caused around the world. The ongoing cold phase of WW3 has, in fact, produced pain and suffering on a massive scale. Because the global population is larger than ever, it is fair to say that the planet has never seen so much adversity on every continent. Putin and his Kremlin team represent the greatest obstacle to the ever-unfolding New World Order agenda. In fact the current round of unlawful economic sanctions by the U.S., Canada, EU member nations and others were instituted in order to target many of the key players in Putin’s inner circle. The cabal’s immediate goal was to soften up as many Putin loyalists as possible thinking that some might leave the Russian establishment. However, they greatly underestimated the determination of the people of Russia to reassert their sovereignty and take back their power from the Western banksters. This is why the cabal has now gotten much closer to Putin himself with the premeditated car crash. With each passing month the Russian president upstages the AAA leaders, as he just did at the G20 meeting in China. Not only did Putin make Obama look like a foolish child, he has continually won the chess games being played out on the global geopolitical chessboard since he first became prime minister. While Putin plays world-class chess, his Western counterparts look like they are barely playing checkers. Welcome to 2016! The year of the grand finale of “The Greatest Show on Earth”, taking place in real time and in living color on a TV set or computer screen near you. The reality here is that the ruling cabal has had the entire planet hardwired for millennia. As such they can perpetrate any crime, any time, any where and get away with it. Taking out Putin’s own chauffeur and personal conveyance is quite easy for them. They know it. Putin knows it. They know that Putin knows it, and Putin knows that they know it. Therefore, the real $64,000 question that must be asked is just how far will these perps go? They know Putin has a conscience. They’re also aware of his unusual magnanimity which they continually exploit by creating desperate situations around the world. In this way, Putin commits himself to putting out one fire after another. Now the fire is very close to home … right down the road from the Kremlin itself. Therefore, it’s quite likely that things will get very ugly, before they get better. Let’s face it, during the final decline and fall of the Anglo-American Empire anything goes. From 2016 onward, things will get even more unpredictable and surprising. Some of those surprises will be very good for the 99%. Many of them will be very disheartening for the 1%. After all, the wealthy elites have everything to lose and very little to acquire, whereas the 99% have much to gain since they have already lost practically everything. The critical point here is that Vladimir Putin has been held up extremely high by the Universe itself as a glowing example of detachment and grace under pressure. As President of Russia, he just puts his head down, charges ahead and does his work. Putin knows all there is to know about the existential threats that he faces, that Russia faces and that the whole of civilization faces. Yeah, he’s got access to the best intel in the world since Russian technology can systematically hack the NSA, CIA, DIA, etc. And yet he seems unfazed and yogically dispassionate even knowing what he knows. Putin is also standing up quite well to all the assaults and attempted takedowns that are aimed at him and his nation. Perhaps it’s about time that the rest of the world followed his exemplary self-sacrifice and enlightened leadership, unparalleled equanimity and ever-present equipoise.